﻿Everyone loves a great pancake. It is like an All-American breakfast food. If you asked me what I thought the top 3 breakfast dishes ordered in America were, I would say: eggs and bacon, biscuits and gravy and ofcourse a stack of pancakes. But after seeing the nutritional content of a stack of pancakes from IHOP I gave up on ordering the staple side-dish to my all-American breakfast. 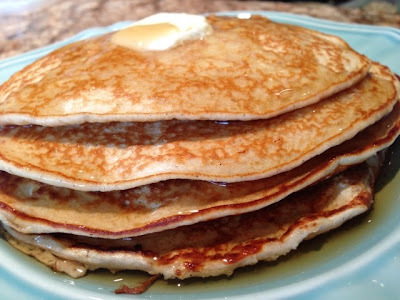 Just the short stack (3 pancakes) alone is a whopping 450 calories and 15 grams of fat. And if you get the regular stack (5 pancakes) you are talking over 750 calories and 22 grams of fat. So I set out on a mission to find or create the perfect, healthy breakfast pancake. I tried several different recipes until I finally hit the nail on the head. My husbands exact words were "When we have kids, they will hate restaurant pancakes after being raised with these" That is like hitting the jackpot in my kitchen. These amazing, healthy little gems are under 200 calories and only 2 grams of fat for 3 pancakes! They are dense and moist and packed with incredible (hidden) good-for-you ingredients. No egg yolk, no buttermilk, no butter, no oil. Even if you aren't on a health-kick or the weight-loss-wagon you should give these a try. They are good for your heart and good for your soul. Put all ingredients in a blender. Blend on low and gradually move to medium then to high. Blend for 1 minute on high. Heat a skillet or griddle over medium heat. Spray with Pam cooking spray. Using a 1/4 cup measuring cup, pour the batter onto the skillet just like you would a regular pancake. It should spread to make a 4-5 inch wide pancake. Once it stops spreading you are ready to pour your next pancake. Only pour the number of pancakes you can fit in your skillet without them touching eachother. I can fit 3-4 in my large skillet. You will notice the trademark "batter bubbles" as you would see when cooking traditional pancakes. Flip the pancake when the underside has turned a golden brown. Continue making pancakes, remember to spray with Pam in between batches. This recipe should make 15 pancakes, serving 5 people. I spray my pancakes with I Can't Believe It's Not Butter spray and drizzle them with sugar free syrup or real maple syrup. Feel free to add blueberries, nuts or any other favorite mix-in to the batter (after blending ofcourse). You can also top your pancake stack with fresh fruit or nuts. WOW sounds yummy, I do love pancakes but I love waffles even more. I take it you can use this as waffle batter also right? Thanks for sharing this.. I don't have a waffle iron so I haven't tried it? Let me know how it turns out though!! Krystal I tried these this morning. Delicious. Always trying to cook healthy in an appetizing way. Making the caprese bread with my pasta dinner later today! So great to hear! Send me pics when you make any of my recipes! I may feature you on the blog! Make sure to get some well aged balsamic or a balsamic glaze to drizzle over the bread! Yum!! OK, now I'm hungry. Wow! So mouth-watering! Thanks for sharing this recipe. I know how to cook pancakes but I only know the traditional style. But this one's great! I will try to use my favorite whey protein powder as an ingredient. Yay! Can't wait to do this!